With the deadline rapidly approaching (21st August!) we had the opportunity for a group tutorial and final critique of each others work. It was great to see each others work in a state of near completion, I am both looking forward to the final exhibition (5-10 September 2014 @ Norwich University of the Arts) and slightly nervous! It will be great to see such an eclectic range of high-quality work on display. It is open to the public, so make sure you check it out. Showing personal work to a broader audience is a little stressful. All the usual questions run through your mind; Will anyone actually like it? Will it work? etc. I was relieved that the feedback I received was pretty positive. When initially installing the work, it didn’t work correctly, although I quickly discovered I had loaded up an old version of the project file. All members of the group interacted with it for a short period of time and seemed fairly engaged in the visuals and sound, especially the 3D rotational effects. A couple of issues became apparent when projecting the work. The first was that the vignette I have used is a bit too extreme and some of the rotational visuals don’t work well when the distance the camera is set up to measure is not setup correctly. Overall the feedback was good and it left with me with some ideas for tweaks to the work prior to installation. One of the key issues with the project installation is installing the camera depth correctly for the size and shape of the room. This does take a short period of time, but must be done correctly for the installation to work. Once it has been setup for a space it can be saved and recalled easily. This became even more apparent when working in the Fusion screen space and testing the work, as this is a substantially larger room. With further time to set up the demo could have looked better. 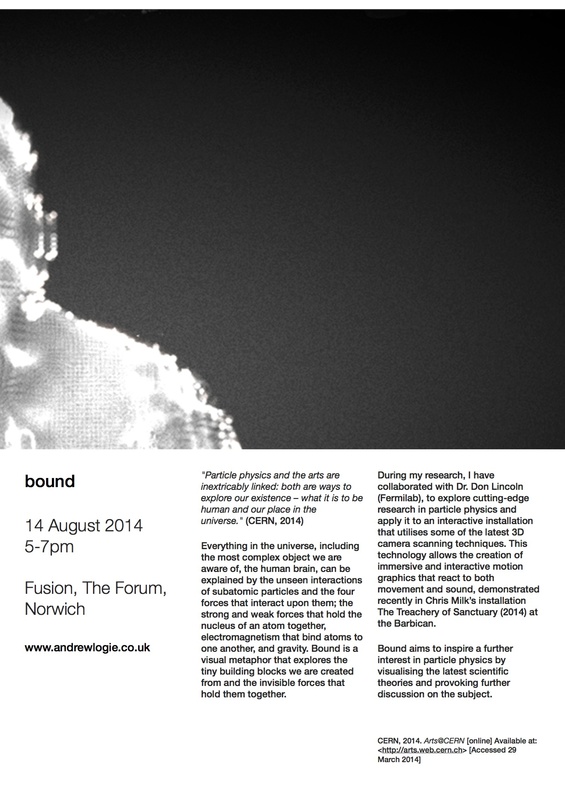 Bound – Fusion, The Forum, Norwich. Aug 14 5-7pm. From a technical perspective the key issue that concerns me is the recall and setup of the software setup. Due to limitations in the software some aspects of my project need to be setup manually each time the installation is restarted (once a day). This is also a mildly complex procedure. This problem will not be an issue for either the Fusion screen exhibition or the first 4 days of the NUA MA show, when I will be around. What concerns me is that I will not be available for the last few days of the exhibition due to work commitments so will not be around to set up the installation each day. This problem could either be resolved by a simple instruction sheet or remote desktop software, which would enable me to set the work up remotely each day. I will need to resolve this issue nearer the time of exhibition. The test at the Fusion screen also went well. I have been very lucky to have the opportunity to show my work on the screens there. I had around an hour when the screen was shut to plug-in my work, ensure it worked and experiment with a couple of different setups. If I had a budget it would be great to utilise 3x cameras and 3x computers, one for each screen. This is not feasible or cost-effective for my work. 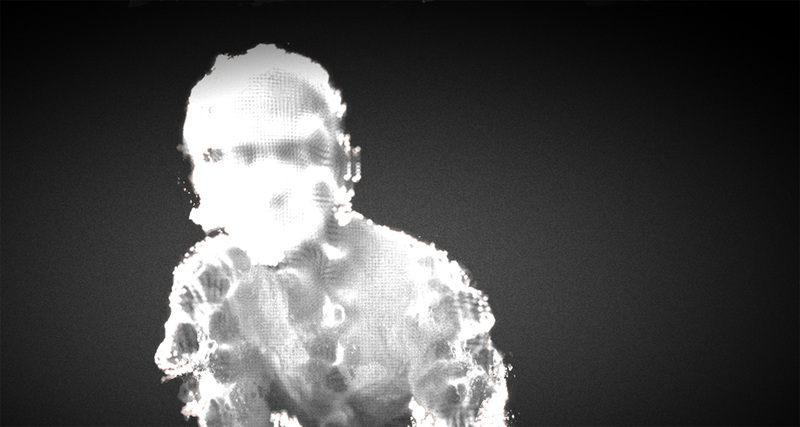 One camera can detect up to 8 different people. I tried this projected multiple times (x3) with the camera in the middle of the room. This looked pretty good. I decided to forego having text/info on the main project display, as it removes the immersion. What I will do to explain my work to the audience is design x3 info displays for the screens in the foyer which you cannot miss on your way into the installation. I am also going to print out some informational flyers for people to take home with them. As mentioned above, the key to the project working is setting up the camera initially for the size of the room. The Fusion screen is a very large space with great sound. To overcome confusion, an area will be taped off with chairs around the edge to draw the audience into the correct position to interact with the work. It worked best when the lights were totally dimmed. I will have 30 mins to set up the work before the audience arrive, this will all be run from a MacBook Pro on this particular occasion, which will be hidden behind the curtains. All health and safety aspects have been covered with a warning sign regarding flashing imagery, emergency lighting and public liability insurance. I will also need to get hold of a USB extension cable of at least 5m before Thursday. The photos below don’t really do the screens justice, I aim to use a DSLR to capture the final exhibition, for some higher quality evidence on Thursday 14th August 2014, 5-7pm. Fusion, The Forum, Norwich.